Editor's Note; Before we get started with the latest challenge we need to say a temporary goodbye to Nancy Dynes and Zoe Hillman who are taking a short break from full DT duties for the next 6 months. We all look forward to welcoming them back in 2018! 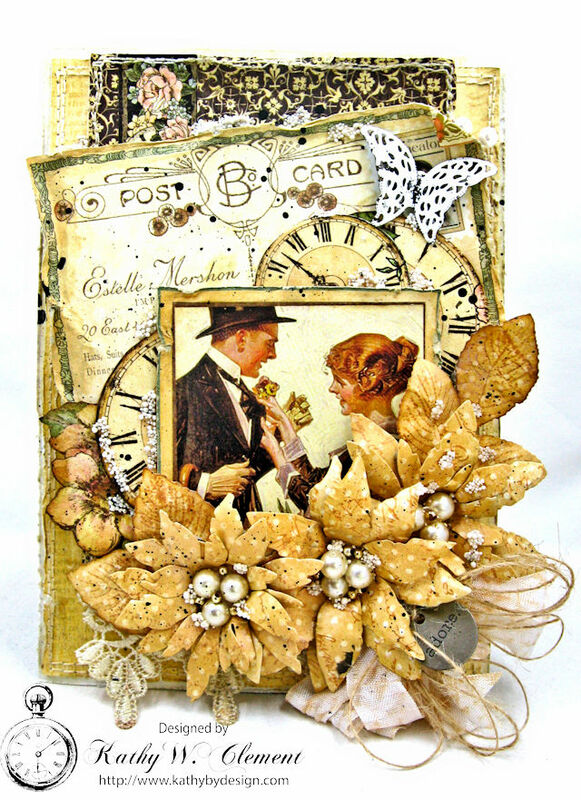 It is wedding season so let's create vintage or shabby chic projects that celebrate the big day. Your creation might be a card, a gift, a decor item or something to keep the memories of the special occasion. The Funkie side of the Design Team has created more gorgeous inspiration for you. To get all of the details of their projects just click on the name of their blog and you will be taken directly there. The Frilly side of the Design Team has created some wonderful inspiration to get you started. To get all the details of their projects just click on the name of their blog and you will be taken directly there. I hope you will join us for this challenge and show us your fabulous vintage or shabby chic wedding projects - we always love to have you inspire us. Remember to come back tomorrow to see what our latest Guest Designer has in store for us, and then again next Wednesday, when the Funkie side of the Design Team will share their latest projects. Can you believe it - half the year gone already! And it's time again to announce our latest Frilly and Funkie winners. Thank you so much to everyone who took the time to enter our 'You're My Inspiration' challenge. The Design Team really enjoyed seeing and hearing about the what inspired you and there were lots of favourites to choose from. This time we've chosen #3 Maggi Harding as our overall winner. 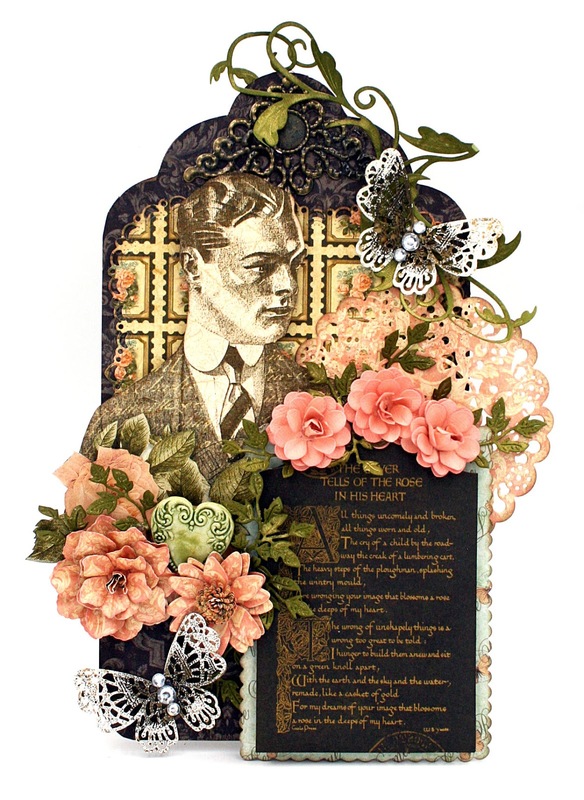 We loved how she took inspiration from the dapper gentleman seen on this tag and built the layers and elements around him with such effect. 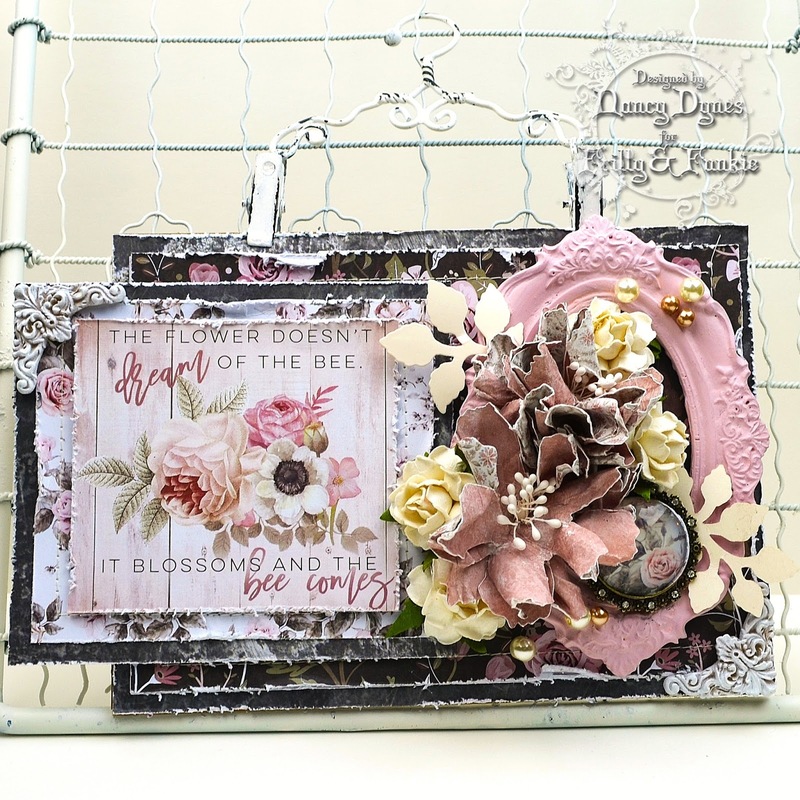 Congratulations to Maggi on being our favourite for the 'You're My Inspiration' challenge and winning the opportunity to be a Guest Designer here at Frilly and Funkie for a future challenge. And now for the three winners of our Frilly and Funkie Top 3 Badges for this challenge; the choices are... #6 Kezzy, #11 Toni Burks and #14 Peg Robinson! Please email Linda at thefunkiejunkie@gmail.com for the codes for the Top 3 badges so that you can display them proudly on your blog. And finally Random.org has chosen a lucky winner for the $25 gift certificate to The Funkie Junkie Boutique. Our congratulations this time go to #10 Kate (Kate's Scrap Yard)! A big thanks from the Frilly and Funkie team to everyone who took part in this challenge and congratulations again to our winners. Once again, please email Linda at thefunkiejunkie@gmail.com for the codes for the winner's badge and to give us your email address for the Guest Designer details (Maggi), for the Top 3 badges (Kezzy, Toni and Peg) and for the gift certificate details (Kate). Our current challenge, 'With This Ring' runs through Tuesday, July 4th. We hope to see you entering this time around so that you too can be in with a chance to win. And don't forget to check out the inspiration from the Funkie side of the Design Team which will be shared on Wednesday, June 28th. Hello! 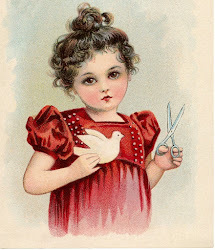 I wish a warm welcome to all of our crafty family at the Frilly and Funkie Blog! I hope you're enjoying sunny summer days and happy times with loved ones. It's Nancy here, and I couldn't be more excited to share the Friday Focus on Prima Memory Hardware with you. That means for the next two weeks all Prima Memory Hardware Products will be available at an additional 15% discount at The Funkie Junkie Boutique! 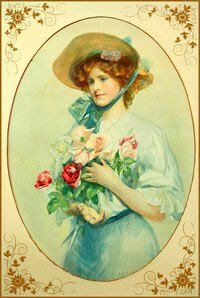 I have a love affair with all things Prima. I don't think anyone can have enough of it in their craft stash. Not only is it beautiful, but everything they make is superior quality. I was a bit panicked over what to create, as I had to place my Memory Hardware mini album project on hold when I unexpectedly ran out of the paper collection I was working with. The panic only lasted for about two seconds, because this is Prima, and the creative possibilities are absolutely endless. I switched gears and decided to go with a wall hanging, which I am sharing with you today! You'll find Prima Memory Hardware products throughout this project, as well as this beautiful Prima Rose Quartz paper collection that is new to me. There was actually a little snag with my order and I received this paper collection instead of the one I was working with. It turned out to be a wonderful blessing, because these new papers are so lovely and such a dream to work with. I am beyond picky about the papers I use, and Prima papers live up to my expectations in every way. Each layer of paper is distressed and stitched together, then mounted on two layers of heavy cardstock. 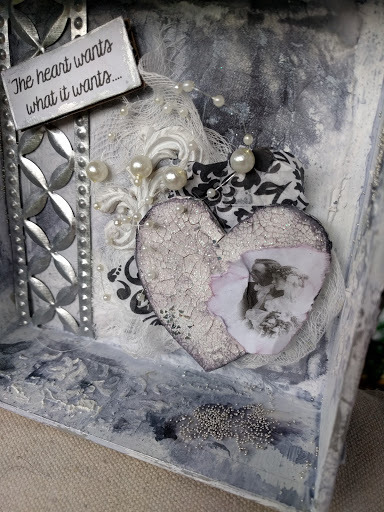 The Prima Memory Hardware Resin Frame is painted with Memory Hardware Antoinette Pink Artisan Powder and Tim Holtz Distress Paints. 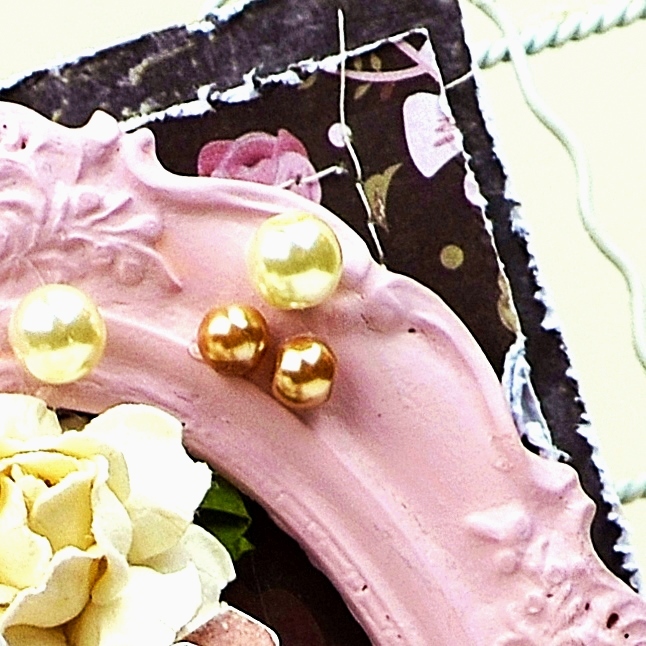 Artisan Powder mixes perfectly with the paints to create this custom color for the frame. True story: I put the leftover paint in the refrigerator in a clear plastic cup for later use. My husband thought it was yogurt and had a big spoonful ready to put in his mouth. I stopped him just in time! Memory Hardware Pearls are scattered throughout the floral arrangement. In Charleston a pearl necklace is a wardrobe staple. A strand of pearls can go with everything, even jeans and a t-shirt. The same is true of craft projects! Pearls add an elegant, feminine touch to everything you create. The flowers are a mixture of handmade and purchased from Linda's shop. You can find a tutorial for my handmade wildflowers here on the blog. A Memory Hardware Vintage Trinket is tucked inside the bouquet. You can place any design or photo inside the trinket frame, making them perfect to tailor to your needs. 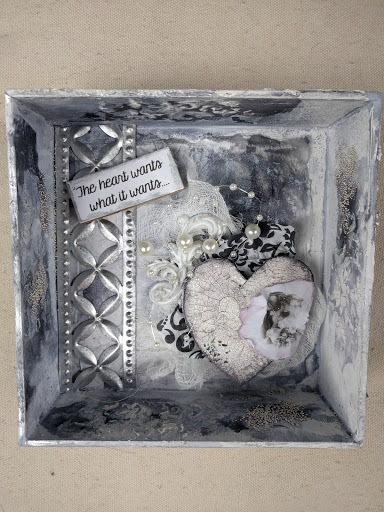 The resin corners are from Prima's Shabby Chic Vintage Treasures, and are also available in Linda's shop. Thank you so much for taking a peek at my little wall hanging. 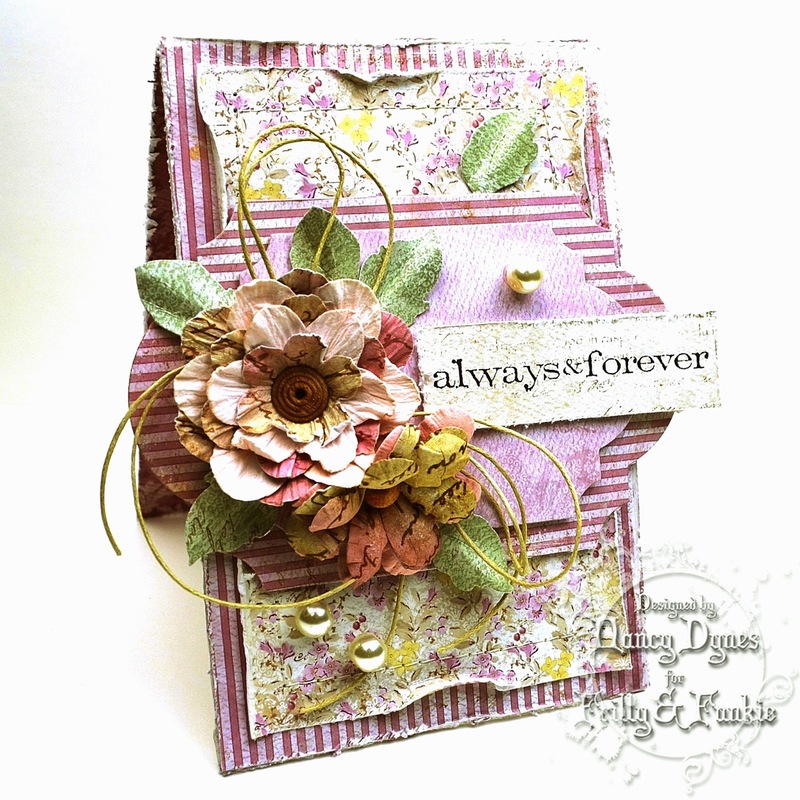 I hope you'll enjoy using these lovely Prima products as much as I do. Not that we need an excuse to shop for crafty goodies, but with a 15% discount through July 6th, who can resist? 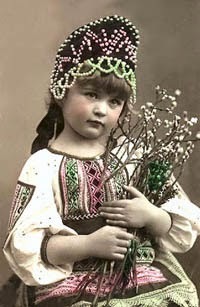 I send warm wishes for a wonderful summer with your loved ones. I'm taking a short break from the design team to attend to family matters, but I'm already looking forward to returning in January. 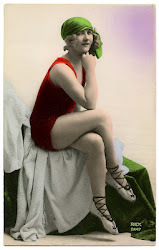 In the meantime I'll still be hanging around y'all's blogs taking in all the fabulous inspiration! CutterPiller Pro Precision Paper Trimmer- 12"
Please say hello and give a warm welcome to Cathy Frailey who is our Guest Designer for the 'With This Ring' challenge. 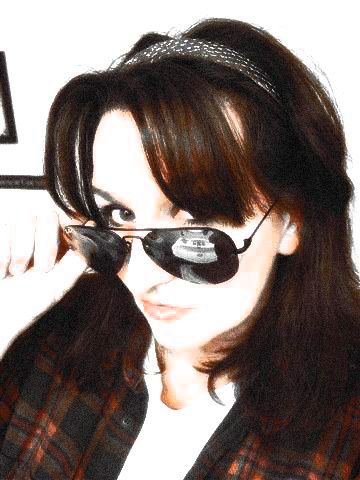 Cathy was the top pick for our 'Sound of Music' challenge and can be found on Facebook. Edit: Cathy just started a blog called It's Oddly Appealing so pop over an give her some love and become a follower so you can see all her new creations. Hello everyone ~ I'm really excited to be a guest designer for Frilly & Funkie this month & was really honored to win the Sound of Music challenge! I love anything grungy, vintage, shabby, steampunk, and out of the ordinary. I like experimenting & sometimes my mistakes turn out to be something amazing! I'm by no means a professional - I just putter in my messy craft room & create what makes me happy! Since the challenge this month is With This Ring, I decided to do a decor piece that's a little shabby/grungy in the spirit of love. I had this box frame/lid in my stash (Approx 6x6 - I think it had another box inside it at one time - I keep everything!) and cut a piece of cardboard to fit the open square in the back snuggly (no gluing). 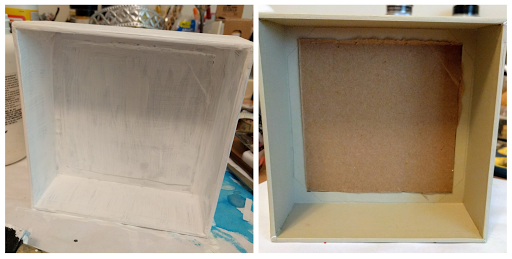 I then painted it with a few coats of white gesso, not really worrying about brush strokes or perfect coverage. 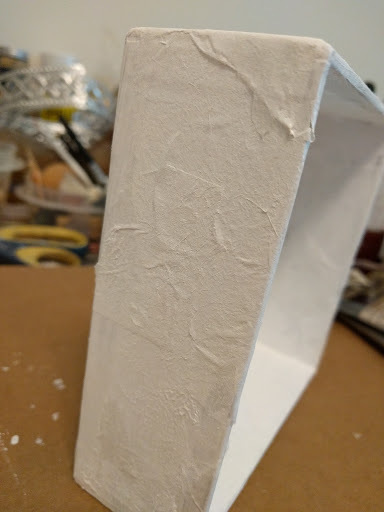 I had some white Mulberry paper so I tore it into various sizes and laid it in different areas on top of the wet gesso. 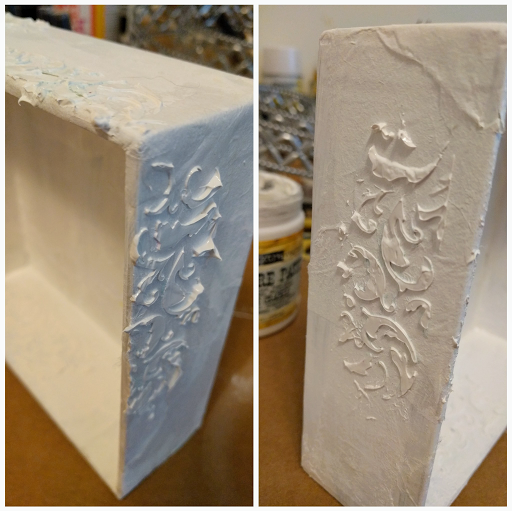 I wanted to see what kind of texture would come out of it in the end when I started dribbling paint. 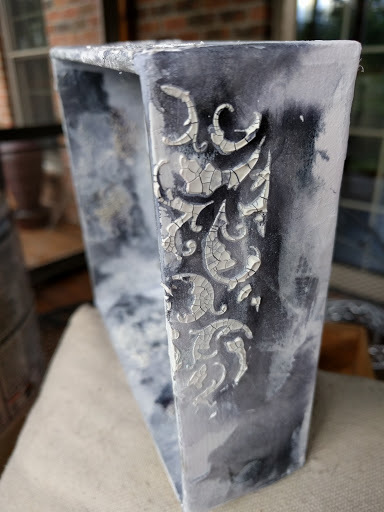 I then used a Prima damask stencil with white crackle paste in various places - again, no perfection here! Then it was time for the messy stuff! I dribbled some Dylusions black spray & then spritzed with water to let it run, turning it various directions, dabbing some off here & there, leaving some areas white. 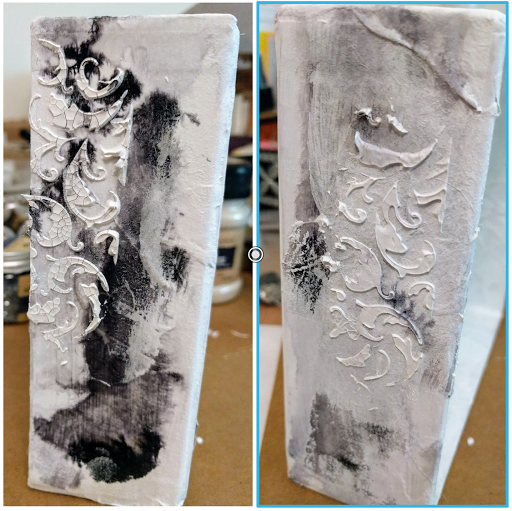 Using a baby wipe to dab here & there gave it a gray cast with some purple undertones - it melded the gesso together with the black. So I went with it! 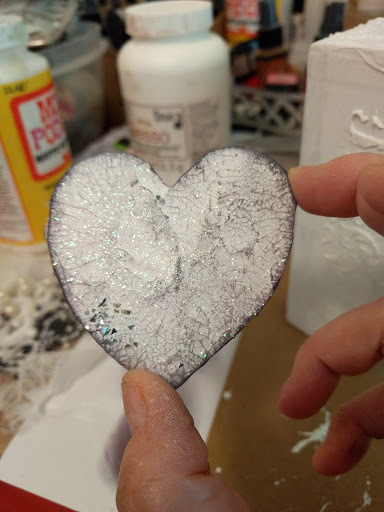 I wanted to use a heart somewhere and didn't have one - so I cut one out of cardboard, covered it with crackle paste, and doused it in fine glitter. I also dribbled on some glass glitter & distressed it when dry. Then it was time to layer my embellishments & tie it all together! 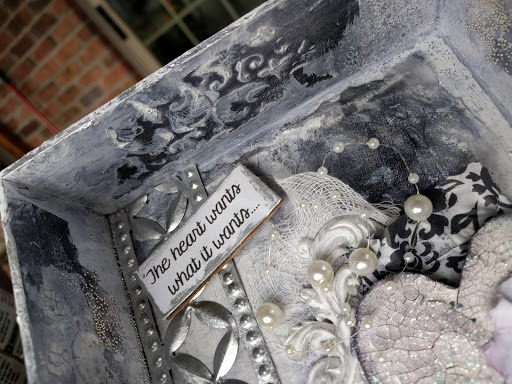 I used some cheesecloth, a resin flourish, some black & white damask tissue paper, and some pearls on wire. I printed out a vintage couple & attached it to the heart. I also had a roll of amazing metal trim (from Etsy) that I cut to fit as an interesting vertical border. A love quote was printed & glued onto a piece of cardboard to give it height. A splash of silver micro beads & a highlight of silver rub 'n buff around the edges & my motley creation was complete! Thank you to Cathy for her fabulous inspiration. 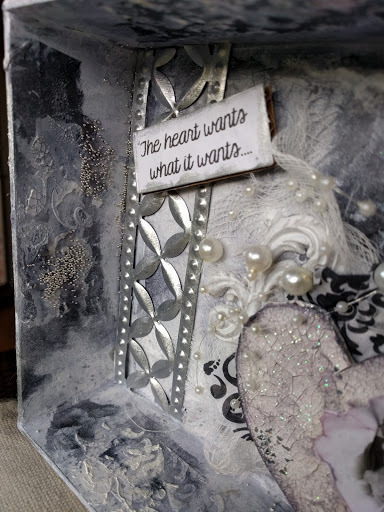 Cathy doesn't have a blog so she has provided all the details for her project here but do pop over to her Facebook page where you will see some of her other creations. 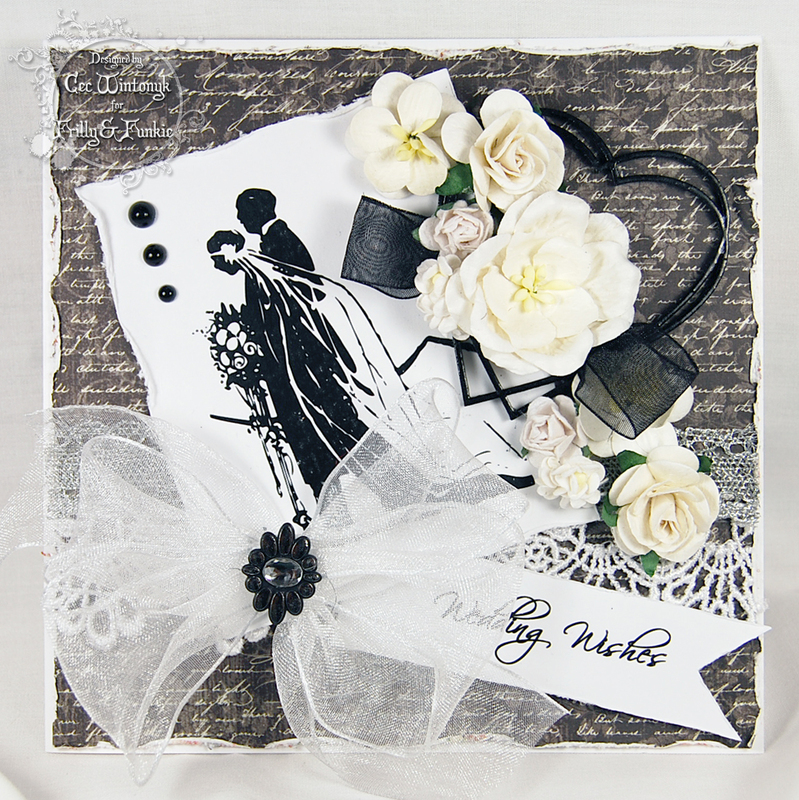 We hope you will share your wedding themed project with us and you have lots of time because the 'With This Ring' challenge runs through 11:55 pm EST on July 4th and can be found here.